This article shows how you can join a conference call on the AT&T Office@Hand desktop app. 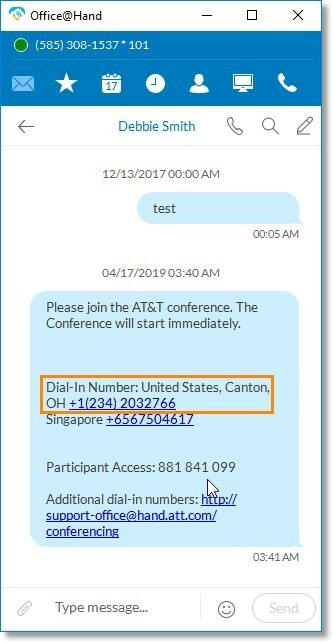 If you are an AT&T Office@Hand User and received the Conference invite on your AT&T Office@Hand Desktop App, you can go to the Messages tab and then, select the AT&T Office@Hand Conference invitation. Click the Dial-In Number. Depending on the settings of your AT&T Office@Hand Desktop App, it will either call the Dial-In Number, or prompt for a RingOut. For more information, go to Placing Outgoing Calls | AT&T Office@Hand Desktop App. Enter your Participant Access Code, and then press the Pound/Hash key #. Further instructions will be provided over the phone.